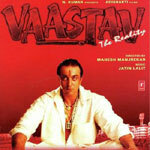 "Vaastav" is a 1999 hindi film which has Sanjay Dutt, Namrata Shirodkar, Mohnish Bahl, Ektaa Behl, Reema Lagoo, Shivaji Satam, Deepak Tijori, Paresh Rawal, Mohan Joshi, Aashish Vidyarthi, Himani Shivpuri, Sanjay Narvekar, Kashmera Shah, Achyut Potdar, Sunil Shinde, Savita, Usha Nadkarni, Kishore Nandlaskar, Jack Gaud, Ganesh Yadav, Aband Abhyankar, Atul Kale, Dr. Ajit Kulkarni, Jayant Sawarkar, Bharat Jadhav, Mangesh Satpute, Ramdas Jadhav, Sachin Suvarna, Arun Badsavle, Ibrahim, Gulshan, Makarand Anaspure, Khalid Siddiqui and Ravi Mishra in lead roles. We have 3 songs lyrics and 2 video songs of Vaastav. Jatin and Lalit have composed its music. Preeta Mazumder, Kavita Krishnamurthy, Sonu Nigam, Vinod Rathod and Atul Kale have sung these songs while Sameer has penned its lyrics.